Another swift text message to my mother while I was in France: "what was in that amazing couscous dish with smoked salmon that you made me two years ago?". Her reply? "Smoked salmon, tomato, spring onion, avocado". I've added red peppers and cucumber to this, and mograbiah (Israeli couscous) on top of the regular variety for a little extra bite. Mograbiah is very easy to find in France, as it is simply called "perles" and is found among the pasta in most supermarkets. It is gradually becoming easier to find in the UK, thanks to the likes of Ottolenghi, but if you live near a good Turkish or Middle Eastern supermarket, you should find it there. I have also seen it in Waitrose from time to time. The list of ingredients is deceptively long as it is very simple to put together. It's a lovely salad too. The salmon and avocado go beautifully together, and the cucumber, tomato and peppers add a definite freshness. Perfect for hot summer's days. To begin, put a pan of salted water with the teaspoon of turmeric added on to boil for the Israeli couscous. Once at boiling point, add the mograbiah and cook according to the pack instructions (it varies significantly from pack to pack). Mine said to cook for 8, so I cooked it for 7 so it was slightly al dente. While the mograbiah is cooking, put the couscous in a large bowl (it swells up a lot, and you will be adding lots of extra ingredients!) and sprinkle on the salt, pepper and mixed herbs. Drizzle with olive oil, then pour boiling water over so it just covers the couscous. Cover the bowl with a large plate or tin foil and leave for 5 minutes so the water is absorbed. Drain the mograbiah and then set aside. 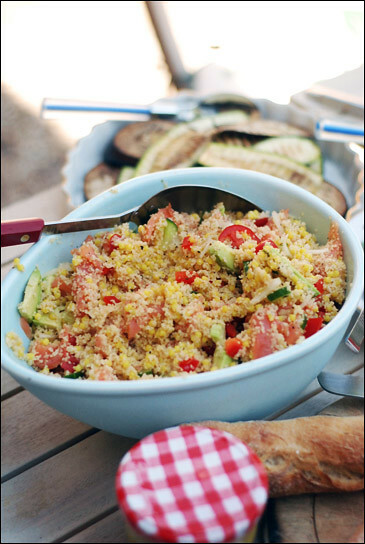 While you are waiting for the couscous to expand, chop the cherry tomatoes in half, slice the spring onions, dice the red pepper into 1cm dice, chop the cucumber and avocado, then slice the smoked salmon into ribbons. Remove the foil from the couscous and fluff up with a fork. Stir in the mograbiah, and then add the smoked salmon and vegetables. Mix well so all the ingredients are well distributed. At this stage, it is worth checking for seasoning. I sometimes drizzle a little more olive oil if it seems too dry, and add a little extra salt and pepper if it tastes slightly bland. I served this as part of a selection of salads, but it is also delicious on its own and makes a wonderful, easy to transport picnic or work lunch. didyou actually make it in the end? why would you post such a useless post Cate? mayeb you shoudl have made it first then given us a real comment, ie it tasted good/bad.